Imagine, if you will, an extremely popular parking lot. This parking lot is so in-demand that, when every single space is filled, people cram their vehicles in the tiny areas between the legitimate spots. People leave their vehicles in the middle of aisles, brazenly blocking the exit path of others. 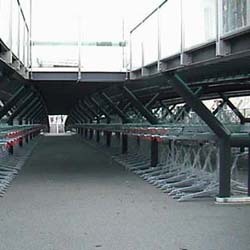 Vehicles are left in a rush, allowed to crash on their sides and obstruct walkways. 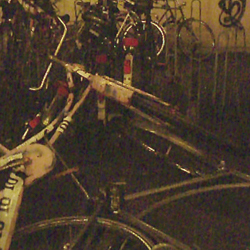 I am writing of the bike parking lot at Leiden Centraal Station. The parking lot opened in November 2002, with 2050 legal spaces, and it’s been in constant overuse since then. When I say legal spaces I am not being facetious. 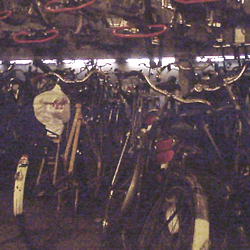 The government has a policy called “Fiets Fout = Fiets Weg”, which translates roughly as “If you don’t park your bike in a legitimate space, we’re going to take it and hold it for ransom.” This extreme form of housekeeping has many critics, including me they never follow through on this threat. Misparked bikes continue to clutter the place, more often than not sporting a rebellious-looking yet meaningless “Fiets Fout = Fiets Weg” sticker on the seat. In the last two months I have noticed a great increase in the number of bikes creatively crammed into every crevice. I arrive at the station early, at around 6:15, every day. At that time of day there are quite a few choice spots to pick, and I used to routinely park within a few steps of the exit. But the extreme nuisance of having to move 3 or more misparked bikes from blocking my own has gotten so bad that I now park in the farthest possible space from the station. It saves me a lot of time at the end of the day – usually I can just unlock my bike and go. 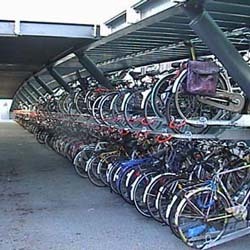 Today, fallen bikes block the aisles. Bikes are crammed in between. 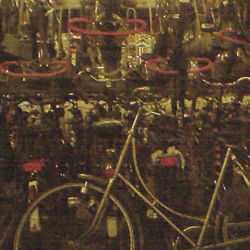 Bikes are left in a jumble. 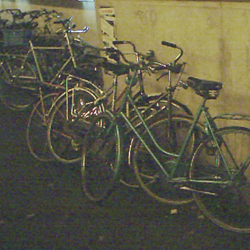 Bikes are left to block others. This entry was posted on Wednesday, December 14th, 2005 at 10:20 pm CET and is filed under Leiden, Life in Holland	with tags . You can follow any responses to this entry through the RSS 2.0 feed. You can leave a response, or trackback from your own site.